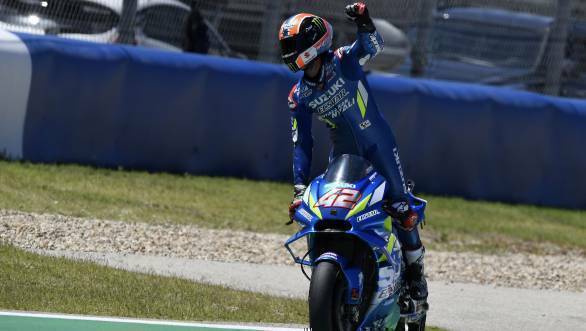 Alex Rins took his first-ever MotoGP win at the Circuit of the Americas on Sunday. The Suzuki Ecstar rider held off Valentino Rossi to take victory, while Jack Miller finished third overall. It was a race that saw Repsol Honda rider, Marc Marquez, crash out while in the lead, putting an end to his winning streak at the American racetrack. In what proved to be a disastrous race for Honda, Jorge Lorenzo retired with a mechanical issue. When pole-man Marquez crashed out, it left Yamaha's Rossi in the lead of the race, with Rins chasing after him. Both riders were steadily pulling away from Miller. And while the battle between the leading pair was close, with just four laps left in the race, Rins managed to pull ahead. Not one to give up though, The Doctor attempted to get back the lead, but ended up going wide, which allowed Rins to open up a gap of half a second at the head. Rins continued in the lead, not allowing himself to be rattled, taking his first MotoGP victory. 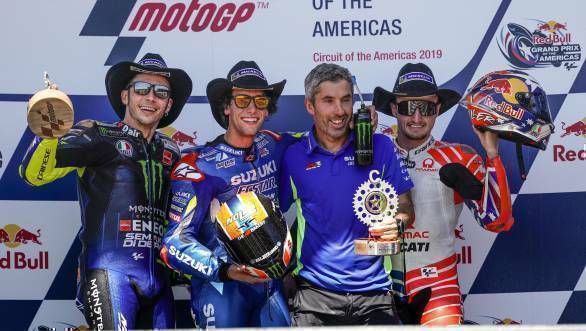 It was also the team's first MotoGP win since the 2016 British GP, courtesy Maverick Vinales. Rossi was able to take second place, although he admitted to feeling sorry about the loss, given that his last MotoGP win came in 2017 at Assen. Third placed Jack Miller made his first trip to the podium since his own Dutch TT win in 2016. Behind them, fourth place went to Ducati's Andrea Dovizioso, who has now regained his lead in the championship standings. Fifth place went to Franco Morbidelli astride the Petronas Yamaha, while Danilo Petrucci finished sixth on the Ducati. Fabio Quartararo finished in seventh place overall on the second Petronas Yamaha, while Red Bull KTM took eighth place courtesy Pol Espargaro. Francesco Bagnaia finished ninth astride the Pramac Ducati, while Takaaki Nakagami finished tenth on the LCR Honda. Vinales, who had incurred a ride-through penalty for a jump start, ended up eleventh overall. While Andrea Iannone took 12th for Aprilia. Johann Zarco took 13th, while Miguel Oliveira finished 14th, and Tito Rabat ended the race 15th, the last of the points finishers. The remaining classified riders were Karel Abraham, Joan Mir (who also incurred a ride-through penalty for a jump start), Hafizh Syahrin and Aleix Espargaro. Cal Crutchlow, who incurred a ride-through penalty at Argentina, crashed out of the race.